You have more time to focus on other activities – Are you sick and tired of sitting in traffic? Imagine how much more productive you could be if you weren’t spending several hours a day behind the wheel. With Merlo’s Charters, say goodbye to driving yourself and freaking out over traffic jams. By scheduling a frequent town car rental, you can catch up on emails and voicemails. Feel free to use your tablet or laptop to watch your favorite shows or check out the latest news. Whatever you choose to do, you will undoubtedly have more time to get things done. 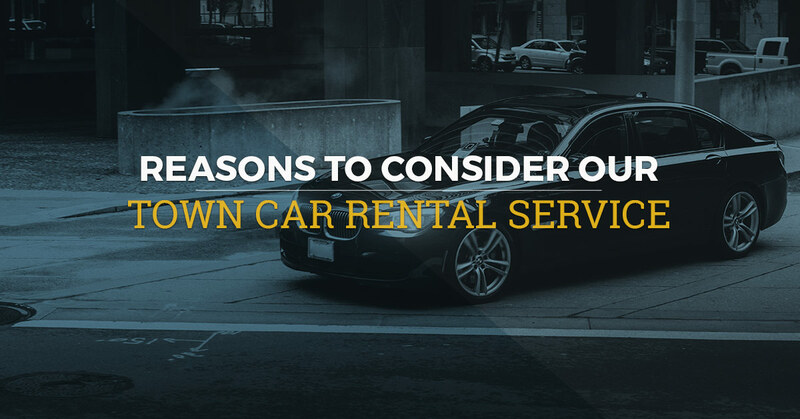 It makes a strong impression – Daily town car rentals make a smart choice for any corporate occasion. For example, will executives be flying in for the week? On the other hand, perhaps you’re picking up a prospective client. In any case, you can count on Merlo’s towncar service to convey the right message. We are proud to offer contract services, shuttling, and event transportation options to fit your needs. It’s convenient – It can be frustrating waiting for a valet to bring up your vehicle from the garage. There’s also the hassle of searching every which way for your vehicle in a giant parking lot. With a town car rental from Merlo’s, there’s none of that. Our drivers handle even the smallest details, from having the car ready to providing safe transportation. All you have to do is relax and let us know where you need to go. It saves you money on vehicle maintenance – We’ve all been there before. You’re en route to an important meeting or conference and your vehicle unexpectedly breaks down. Why take this chance, especially if you know your car isn’t in the best shape? Merlo’s eliminates the possibility of expensive car repairs. It ensures the safety of you and your passengers – As the best charter bus service in Houston, you can count on your driver to research where you’re going ahead of time. You can feel comfortable knowing that each of our towncars has built-in GPS systems for easy navigation. Say goodbye to the days of having one hand on the wheel and attempting to follow a directions app with the other. Here at Merlo’s, customer safety is our number one priority. There’s no need to settle for a mediocre charter bus service or town car rental service. Our four-door luxury sedan features an extended body, leather interior, and eight inches of extra legroom. For two decades, Merlo’s has provided dependable ground transportation to corporations and businesses alike. In addition to town cars, we also have an extensive selection of minibuses, shuttles, limos, motor coaches, and SUVs.